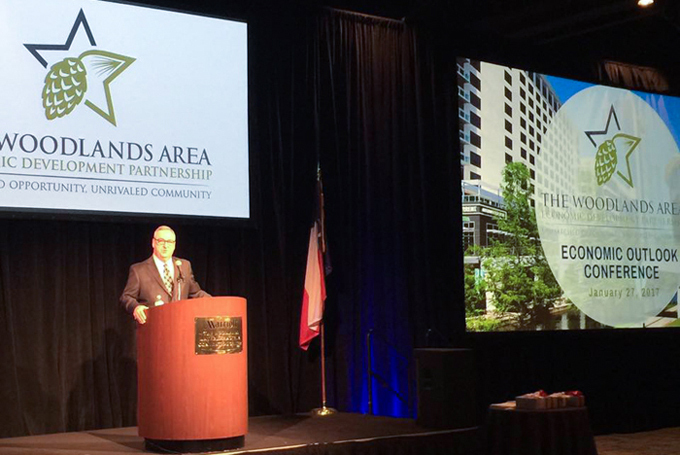 Business leaders recently gathered for the annual Woodlands Economic Outlook Conference, where experts and elected officials offered up analysis of the financial situation in Montgomery County, the rest of Texas, and around the world. Hundreds who attended the event presented by The Woodlands Area Chamber of Commerce listened to an impressive lineup off speakers including Goldman Sachs Executive Heidi Cruz, State Senator Brandon Creighton, CEO of The Woodlands Area Economic Development Partnership Gil Staley, Township Board Chairman Gordy Bunch, US Rep. Kevin Brady, and Texas Comptroller Glenn Hegar. Township Board Chairman Bunch spoke about his vision for the community, saying “I want our township to be an example for all the cities in Texas, our country, and the world as well.” The success of The Woodlands is easily summed up but not so easily done, Bunch said. It’s all about “the quality of life, our first-class amenities, our low tax rates, a vibrant local economy and what I call intentional investment," he said. That “intentional investment” includes expansion of the Cynthia Woods Mitchell Pavilion – making it the number two venue of its kind on Earth – as well as the expansion of The Woodlands Mall, the largest generator of sales taxes in the township. Bunch also pointed out that when residents were asked what words accurately describe The Woodlands, the number one response was "beautiful." The Township Board uses a pay-as-you-go approach, Bunch said, arguing it was better to avoid the kind of debt that other government entities often embrace. “More impressive, I think, is the reduction of our debt in such a short period," Bunch said. The Woodlands has reduced total debt 31 percent over the last 5 years while the residents enjoy low tax rates, he said. “I can safely say that we are the best township in the state,” Bunch joked, since there isn’t another community in Texas organized as a township. “There is not a better one," he said, drawing laughter from the crowd. Job growth in the area over the past year has been impressive, said Gil Staley, CEO of The Woodlands Area Economic Development Partnership. “Despite the oil slump, we added jobs here," he said. In 2016, roughly 70 companies created more than 33,000 jobs, a number that’s up more than 500 jobs in the previous year. Staley had been anxious to see the jobs numbers, he said. Staley told the crowd that if he had been asked a few months ago for a prediction, he might have anticipated job losses instead of growth in the three biggest sectors for the area: Energy, health care, and professional services. State Sen. Brandon Creighton, R-Conroe, and Comptroller Glenn Hegar spoke about the resiliency of the state’s economy even during some of the toughest economic times the nation has seen in recent memory. Sen. Creighton said leaders at the Capitol in Austin understand that it was very important to avoid a repeat of the 1980s, when there was an oil bust and Texas’ economy was inextricably linked to the health of the oil and gas industry. “I think we've been successful on that front," Creighton said, adding that even though oil and gas is still a critical component of the state’s overall economic picture, the diversification of the economy here has been rapid in the decades since the oil glut of the 80s. Comptroller Hegar compared the state’s economy to other powers around the world, pointing out that Texas’ economy is larger than that of Russia. “People are so worried about Russia...maybe they should be worried about Texas,” Hegar quipped. Prior to Hegar’s talk, Goldman Sachs Executive Heidi Cruz, who is also the wife of Sen. Ted Cruz, said the global economy is on pace for growth and the United States will track with that if its leadership does initiate trade disputes. That, of course, is a real concern given some of the early moves of President Donald Trump, including his proposed 20 percent tax on goods from Mexico to help finance a physical barrier on the international boundary. Cruz, who is also on the board of the Greater Houston Partnership, said she expects worldwide GDP to rise modestly over the next year from 2.5 percent to 2.9 percent. Without mentioning President Trump by name, Cruz said part of what could prevent that growth is the start of trade wars with nations like Mexico and China. Investors should be excited that the new administration is talking seriously about significant government spending on infrastructure, Cruz said. That kind of policy would have a positive effect but with “uncertain magnitude,” she said. “The growth impact is still uncertain as it depends on the composition and timing of the (stimulus) package as well as the multiplier effect,” Cruz said. As an example, Cruz said if Congress were to approve a $200 billion stimulus package it could take GDP growth from .3 percent to .5 percent by 2018. One thing is certain, Cruz said: Government spending in this environment would give the U.S. economy a bigger boost than a cut in the corporate tax rate. Slashing corporate tax rates down to 25 percent would be akin to icing on the cake for investors, she said. “While tax cuts may not have a big and immediate effect on GDP growth, it does have a significant impact on the market,” Cruz said.